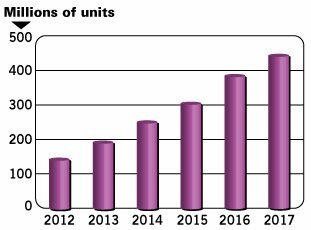 IHS iSuppli says that small AMOLED displays for mobile phone applications will grow at a compound annual growth rate (CAGR) of 26% from 2013 to 2017. Shipments in 2013 will reach over 195 million units, and this will grow to over 447 million in 2017. AMOLED mobile handset market share will grow from 7.9% in 2013 to 15.2% in 2017. Interestingly, iSuppli estimates that the AMOLED market share for 4" or larger displays will only grow from 23% to 24.4% by 2017. This means that most of the AMOLED growth will come from smaller displays, and that major handset makers besides Samsung (i.e. Apple, HTC and LG) will not adopt AMOLED displays. This seems rather unlikely to me. Especially when you consider flexible OLEDs - and that LG already said that these displays will bring "real value" for mobile devices.